The Seahawks are looking for depth at linebacker with K.J. Wright still working his way back from arthroscopic knee surgery and Bobby Wagner added to the injury report Wednesday with a groin issue. 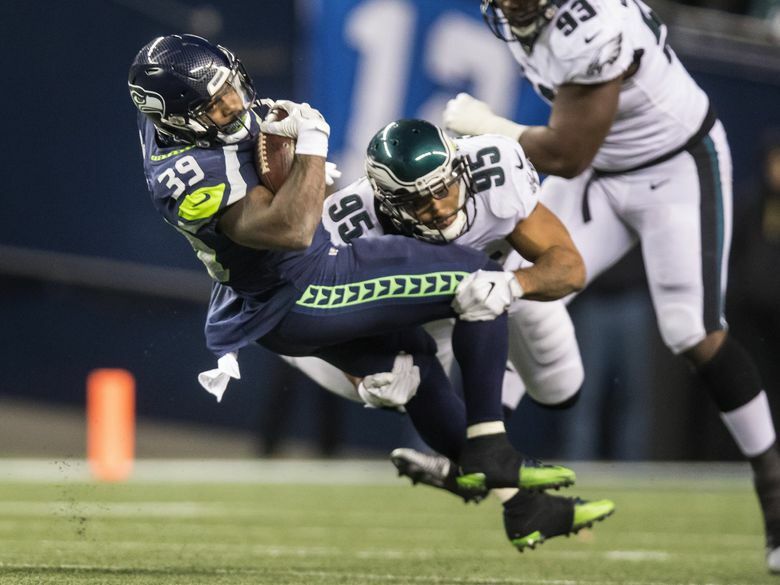 The Seahawks are expected to sign free-agent linebacker Mychal Kendricks — recently released by the Cleveland Browns after pleading guilty to insider trading — a source confirmed to the Seattle Times, and he could play immediately to add depth at a suddenly injury-riddled position. The signing was first reported by Adam Schefter of ESPN, who reported it will be a one-year contract. Schefter also reported Thursday that Kendricks’ sentencing has been pushed back until January, meaning he could be available to play the entire regular season, and it’s possible it could be pushed back further. Schefter also reported Kendricks could be sentenced to 30-37 months in prison as a first-time offender after he admitted to earning about $1.2 million in illegal profits in four major trading deals. However, the NFL has not taken any action on Kendricks’ case, and while he could be suspended later — assuming the NFL may not be done reviewing his situation — for the moment he is eligible to play. Schefter reported that Kendricks is expected to play for the Seahawks on Monday night against the Chicago Bears. Since Kendricks is a vested veteran but is signing after the first week of the season his contract is not guaranteed, meaning the Seahawks can cut him at any time owing him only for the games he plays. Kendricks has primarily played weakside linebacker in a career that dates to 2012. Seattle’s starting weakside linebacker, K.J. Wright, remains sidelined after having arthroscopic knee surgery two weeks ago and it’s unclear when he will return. Middle linebacker Bobby Wagner also showed up on the injury report Thursday with a groin issue and while it’s unclear the severity of that injury — coach Pete Carroll did not mention it when he met with the media before practice on Thursday and before it was known Wagner was injured — his injury could also have played a role in Seattle’s interest in Kendricks. Kendricks played from 2012-17 with the Eagles, earning a Super Bowl ring with Philly last season, before signing with the Browns in the offseason. He was the 46th overall pick of the Eagles in the 2012 draft, taken one spot before Seattle drafted Wagner. It’s often been thought Seattle may well have taken Kendricks — a Fresno native who was the Pac-12 Defensive Player of the Year in 2011 at Cal — instead of Wagner had he been available. Without Wright, Seattle gave rookie Shaquem Griffin the start at weakside linebacker against Denver. But after some struggles for Griffin in the early going against Denver, Seattle then also used Austin Calitro there, typically playing Calitro — who was also playing his first NFL game Sunday — on early downs and Griffin on third downs. Carroll was noncomittal on who would start at weakside linebacker, and said earlier in the week that it could depend on how practice goes this week. Asked about Griffin and his defense against the run Sunday, Carroll said that fitting runs correctly is always a challenge for young players. As for Wright, Carroll said he has begun a running program and was due to work out later in the day but there was no clear timeline yet for his return. As reported by several outlets, Kendricks used tips from an acquaintance, Damilare Sonoiki, to make roughly $1.2 million in illegal profits on four major trading deals in 2014 and 2015, according to federal prosecutors. Sonoiki had been working as a junior analyst at Goldman Sachs but left the financial field and has most recently been writing for TV shows, according to SI.com. Kendricks plead guilty in a Philadelphia courtroom last Thursday. According to the Inquirer, the judge said she wanted to be sure that Kendricks was not coerced into pleading guilty. “I’m making the decision because it’s the right thing to do,” Kendricks said, according to the Inquirer. It’s thought Kendricks’ admission of guilt and contrition played a role in the Seahawks’ willingness to sign him.